Freshwater shrimp are amazing little creatures that come in every color except purple and are perfect for adding that little something extra to a tank. They range in terms of hardiness, so while some are extremely difficult to keep, others need almost no care at all. In this article, we will cover several species of freshwater shrimp, as well as testing kits and common illnesses. Neocaridina come in a massive variety of colors, essentially everything except purple, as well as three pattern types. The most common type is a solid colored red shrimp, hence the name “red cherry”. This type of shrimp is the easiest colored shrimp to care for. They will eat anything you throw at them and are a great cleanup crew! However, most of their diet is “biofilm”, which is a natural buildup on everything in an aquarium. It takes several months to develop a mature biofilm, so shrimp should only be added to a fully cycled and mature tank, which takes around 2-3 months. There are two main lines of Neocaridina davidi. Both are from the same species but have simply been line bred into different colors. One side has many lighter colors, such as the red color, range, green, yellow, light blue, and various rilis of each color. The other side has darker colors, such as the black rose, blue dream, blue velvet, carbon rili, chocolate, Bloody Mary, and blue carbon rili. The three pattern types are solid coloration, wild coloration, and rili. Solid coloration is a shrimp that is one solid color. Wild coloration is typically a brown shrimp that has intricate brown clear, white, and cream stripes. Rili coloration refers to a shrimp that has a clear midsection but a solid colored back and front half. Rili shrimp either have a fully clear midsection or one that is faintly tinted another color, usually blue. Cherry shrimp are compatible with any fish or shrimp that will not eat them. They are not aggressive in any way, shape, or form, and are generally fry safe. However, their babies are scarcely more than a few millimeters in length, and there are not any fish that are 100% “shrimplet safe”. If you need clarification on what the heck kH, gH, and TDS are, skip down to the “Shrimp Test Kits” section. The crystal red and crystal black shrimp are some of the most beautiful shrimp for planted aquariums. While neocaridina shrimp tend to have translucent colors (aside from high grade cherry, black rose, and Bloody Mary shrimp), the Caridina shrimp have very strong, solid coloration (with a few exceptions). 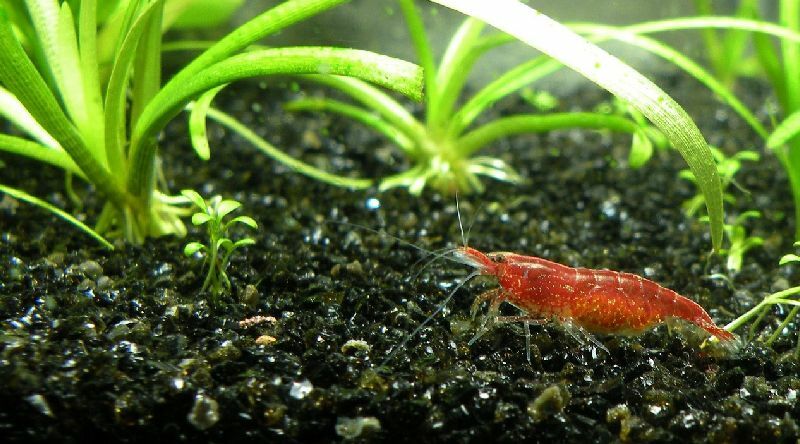 The crystal red cherry shrimp is one of the most popular choices for nano planted tanks. However, these shrimps are very sensitive, so a nano tank needs to be at least 5 gallons to keep their parameters stable. Changes in gH, kH, or TDS from evaporation can be lethal in a very short time to these shrimps. They also need an established, mature biofilm present in the tank, so this gives you plenty of time to plant it and set it up however you want to. 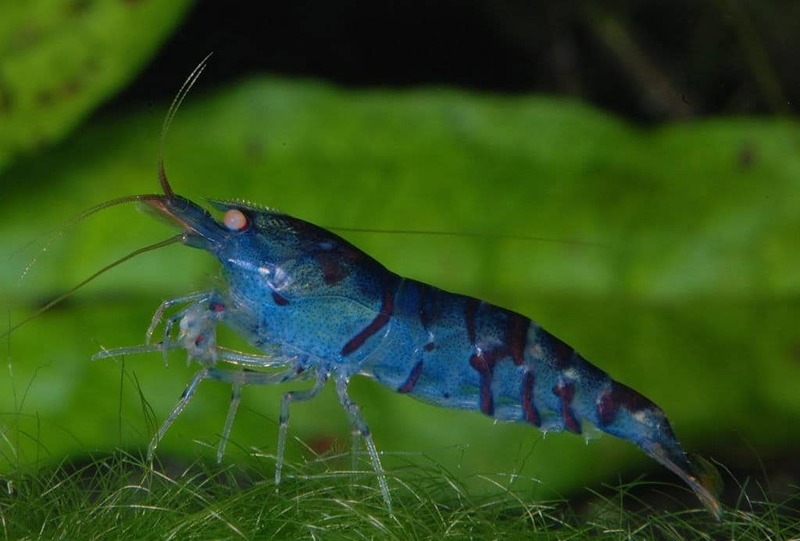 Since these are a more expensive shrimp, most people do not house them in community tanks, but it is more than possible to house them with peaceful tank mates. The main issue with community aquariums is that these shrimps often do not tolerate large water changes. Water changes that are more than 10 or 20% can shock them and kill them. In addition, nitrates are toxic to these shrimps at lower levels than fish, so it is difficult to keep nitrates down when you can only change 10% of the water at a time. Tiger shrimp are clear bodied shrimp with thin vertical stripes. They are similar to Crystal shrimp in terms of hardiness and ease of care. They need an established tank as well and don’t tolerate water changes larger than 10 or 20%. They feed primarily upon detritus and biofilm, like most other shrimp, and are also grateful for shrimp pellets and blanched vegetables. Breeding for Caridina is the same as it is for Neocaridina, with the shrimplets being of a similar size. There are many different color variations, most notably the OEBT, or Orange Eyed Blue Tiger, which is a variant with a deep blue body and stripes along with orange eyes (pictured above). There are also Black Tigers, Orange Eyed Black Tigers, Royal Blue OEBT, Blue Tigers, Super Tigers, Tangerine Tigers, and Galaxy Tigers. These shrimps are absolutely stunning and gorgeous. Their difficulty in care and striking coloration make them a sort of “holy grail” for shrimp keepers. The Wine Red shrimp is the red version of the Black King Kong and shares the same patterns. The Wine Red and Black King Kong are either solid in color, have a small white triangle on the hump on their back, or a striped white “panda” patterning. The striped pattern is the reverse of the Crystal shrimp. 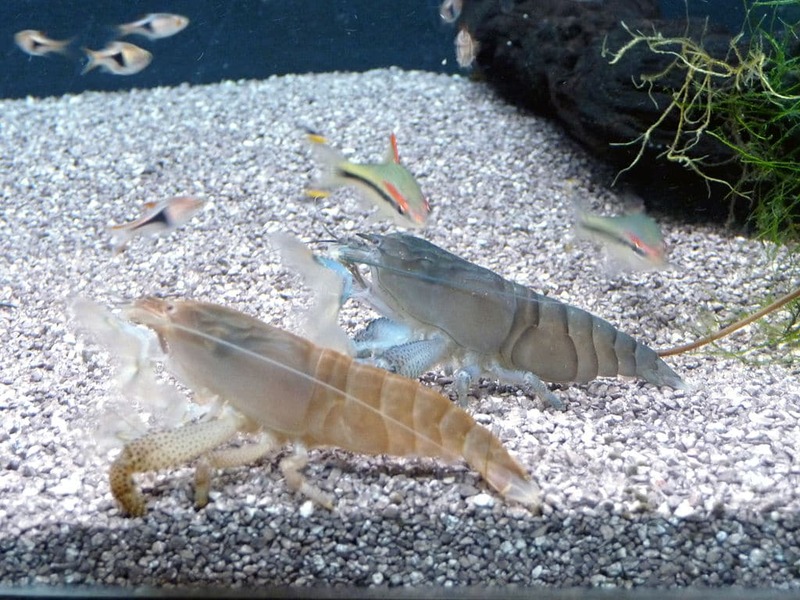 Crystal shrimp have white heads, while BKK and Wine Reds have black and red heads, respectively. 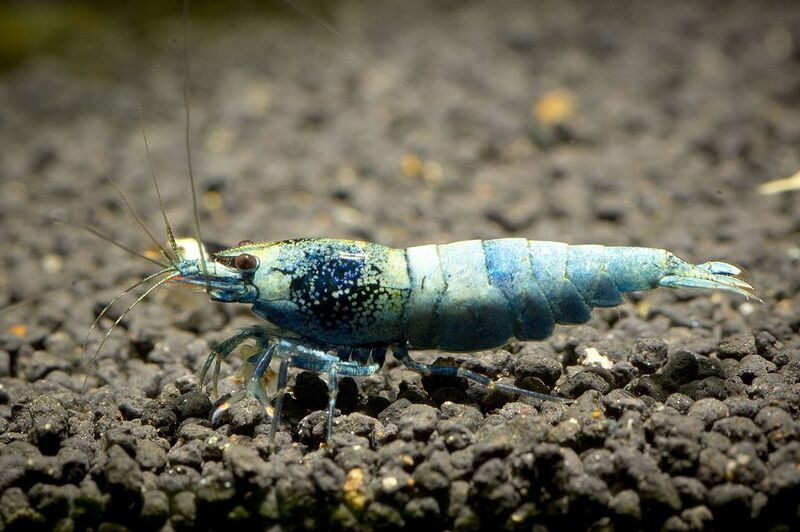 The Blue Bolt shrimp does not have any exact patterning, only grades based on the amount and color of blue that they have. Lower grades have mottled blue heads with white bodies, and as the grade increases, the amount of white lessens, and the blue deepens. All of these can be kept together in the same tank without losing their coloration. The babies will look like the adults, and even if different colors breed, they will breed true. These shrimps are extremely expensive, and you could end up paying over $100 for a single shrimp, so they are not commonly found in community aquariums. 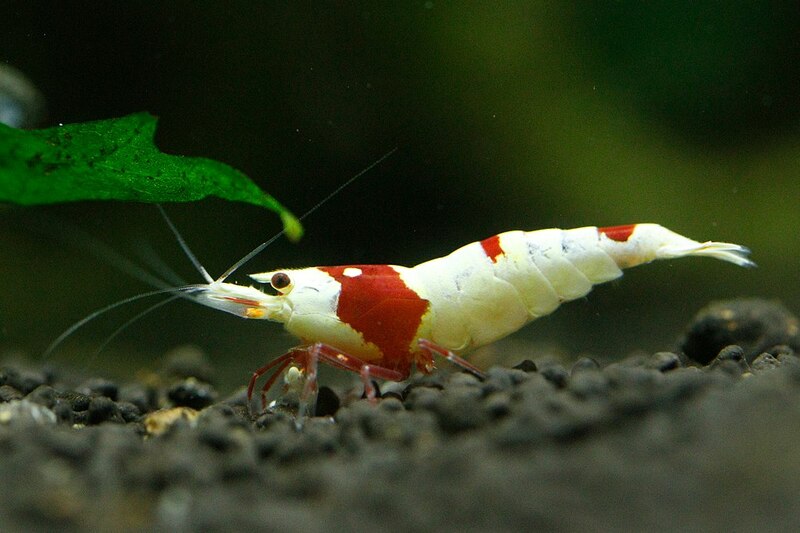 Pinto shrimp have the classic solid coloration of the Caridina shrimp. They have white stripes, triangles, and spots depending on the patter, and come in black and red versions. The patterns are divided into Fancy, Zebra, and Spotted Head. These are very difficult to care for, but their beauty is the reward. Some of the more famous fancy patterns are cloud, fishbone, skunk, spotted head, and galaxy. A handful of the pinto patterns even breed true, but others provide opportunities for you to develop your own strain of pinto. These shrimps, like other sensitive Caridina, do not tolerate large water changes. In addition, these are some of the most expensive Caridina out there and do not always breed true. For these reasons, people keep them in species only tanks to keep an eye on them and their offspring. Amano shrimp are beautiful shrimp and extremely easy to care for. They are a social animal and need to be in groups of at least three. It is entertaining to watch them all scuttling around together, going over plants, swimming around and snatching food right from under a fish’s nose, and then swimming off to go eat it away from the others. These shrimps are some of the best algae eaters in existence. They’ll take care of that nasty hair algae, unlike any other shrimp. Their name is derived from from the greatest aquascaper ever to live, Takashi Amano, who introduced them into the aquarium hobby. 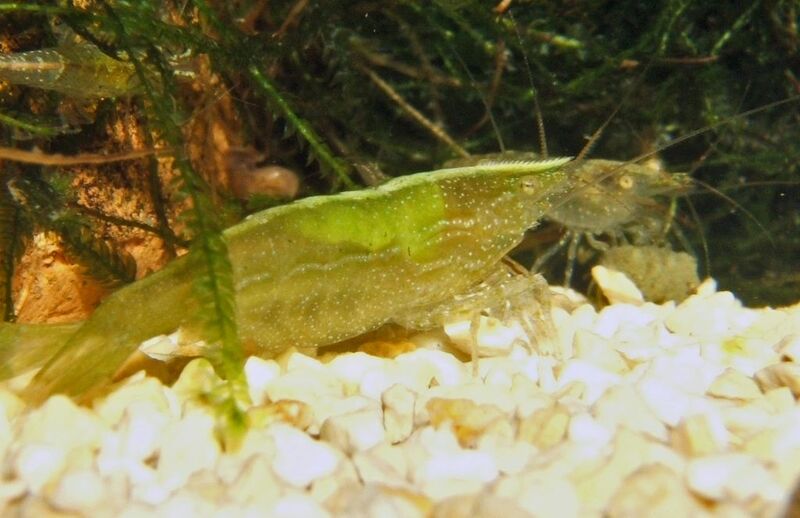 Most Amano shrimp are wild caught, as the young must go through a brackish, or saltwater, stage before undergoing metamorphosis, at which point they can no longer survive in brackish water. It is unclear what they eat in brackish water during their larvae stage, but phytoplankton and golden pearls have been successful foods so far. Bamboo shrimp are beautiful little shrimp with amazing camouflage capabilities. They are a filter feeding shrimp, so a strong current is necessary. They like to sit on decorations that are in the strong flow and open their fans. The bamboo shrimp wave their little fans around in the water, occasionally running it across their mouth. 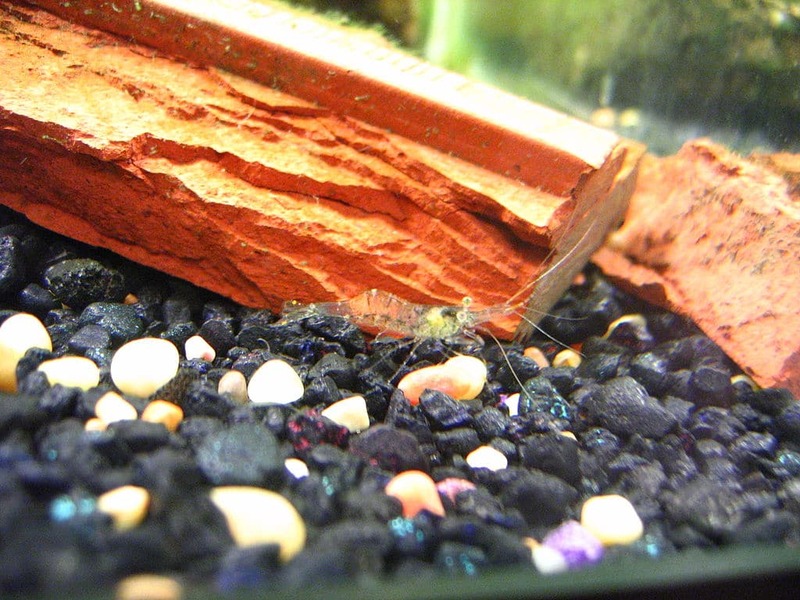 Their specialized fans catch tiny particulates in the water, which are the bamboo shrimp’s primary source of food. This type of shrimp greatly appreciates hiding places and cover, as they have no way to defend themselves. The good news is that they fit into most community aquariums, as long as the aquarium has high flow and peaceful inhabitants. Their care level is ⅖ because they are filter feeders. It is difficult to ensure that filter feeders get enough food, so they do require some extra care. Ghost shrimp are the easiest shrimp to care for. These shrimps are also called glass shrimp and are commonly used as feeders, so they are often only $0.30. They are incredibly hardy, and as long as they are drip acclimated like the other shrimp, they should thrive. However, since they are commonly used as feeders, expect ⅓ to ⅔ of the shrimp you pick up to die. The conditions they live in are deplorable, and lead to early death. That being said, there are not any shrimp that are easier to care for than these guys. They are commonly kept with bettas, as they are too big to be eaten, and work for most community aquariums. They will constantly graze along the bottom for leftover food that fish missed but may need supplemental feeding of shrimp pellets so they get enough protein. To breed the shrimp, you need both a male and female. The shrimp will mate, and the female will be seen holding eggs in her swimmerets for 3-4 weeks. After this time, the eggs will hatch into young larvae which will hunt infusoria for a week before undergoing metamorphosis. Indian Whisker Shrimp are remarkably similar to Ghost shrimp, but there are more reports of them being aggressive to fish like bettas. Ghost shrimp have two faint red dots on their tail, red bands on their claw arms, and often some red on the antennae. Indian Whisker shrimp lack these, have a faint blue tint, and will grow longer claws as they age. Aside from these subtle differences, the two shrimp look identical and are often sold as one another. One of the other major differences is that the young of the Indian Whisker shrimp will not survive in freshwater, while the ghost shrimp young will. Want a crayfish for a community tank, but don’t want all of your fish to die? 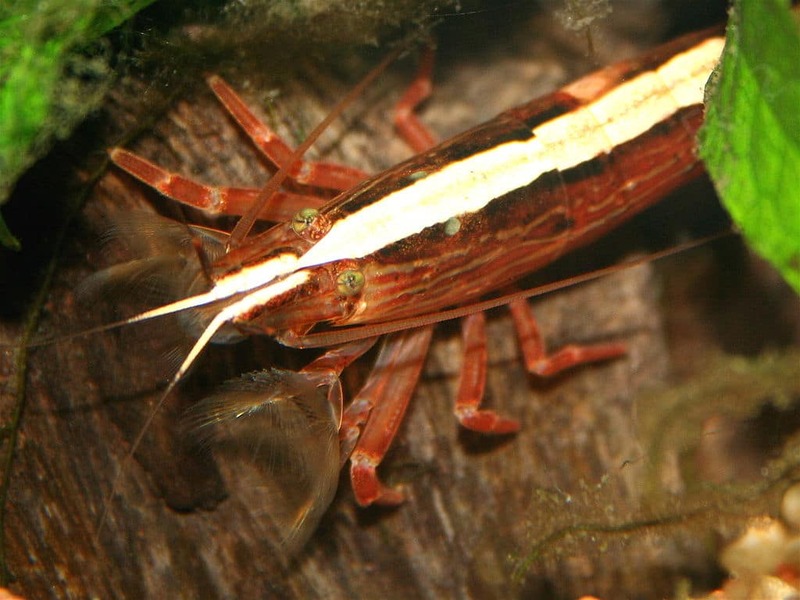 The vampire shrimp is a friendly alternative to large crayfish, despite its spooky name. They have thick bodies and look like crayfish at first glance, until you see that their claws are actually fans. These generally reach sizes of 3” in the average aquarium, though some do claim that they can reach twice that size. They are a filter feeder, so damaging your fish is not possible. However, this does mean that they need an aquarium with suspended particles and high flow. These shrimps are rather skittish, despite their large size, and will spend most of their time either hiding or hanging out in a high flow area. It is a good idea to put a large decoration or two in areas with high flow, so the shrimp can sit on top of them and collect its food. Unfortunately, most of these are wild caught and tend to be rather rare. Unless you have an amazing local fish store, you will have to order them online. 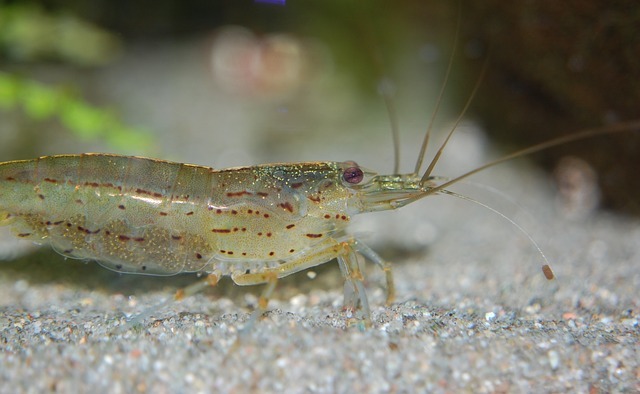 They are not often bred in captivity, because just like Amano shrimp, the larvae need brackish or salt water to grow, but the adults cannot tolerate much salinity. The ranking of ⅖ difficulty is simply due to the fact that they are filter feeders and skittish. These shrimp love to eat decaying vegetation, so a planted aquarium is the best possible home for them. Additional feedings of blanched vegetables are something they will absolutely love as well. They are a newer addition to the shrimp keeping hobby, so not much is known about these adorable and colorful little fellows. They can be kept in community aquariums with peaceful fish and neocaridina shrimp, but they tend to be shy and can be easily intimidated. 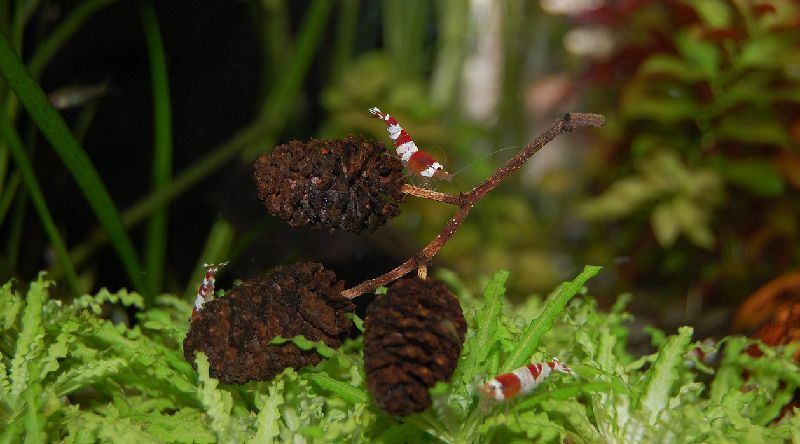 It is possible for these shrimps to interbreed with other Caridina shrimp, which is why it is recommended to only keep them with neocaridina dwarf shrimp. Taibee shrimp are a cross between Taiwan Bee Shrimp and Tiger shrimp or a cross between Tiger shrimp and Crystal shrimp. Crossing Taiwan Bee shrimp and tiger shrimp is mainly done to produce stronger Taiwan Bee shrimp or to increase the population if you do not have enough Taiwan Bees. Taibee shrimp that are Tiger x Taiwan are normally crossed back to another Taiwan Bee shrimp for the second generation, as this will produce more Taiwan Bees. In addition, these Taiwan Bee shrimp will be hardier due to the Tiger shrimp genetics. A cross between a Tiger shrimp and Crystal shrimp can result in “Fancy Tigers”, which are shrimp that have the bold, opaque coloration of Crystal Red or Crystal Black shrimp, but in the mottled and striped pattern of a Tiger shrimp. A Taitibee is a Tibee, nearly always the Tiger x Taiwan Bee, crossed back with another Taiwan Bee shrimp. They are not true Taiwan Bees due to the Tiger shrimp genetics, and they cannot be sold as such, as later generations can result in abnormal coloration or patterns. The pinto shrimp is one of the most famous Taitibee Shrimp. A mischling shrimp is the best way to get started with Taiwan bees, though you will likely have to wait a good long while for them. A mischling is a cross between a Taiwan Bee shrimp and a Crystal Red or Crystal Black shrimp, normally done to improve hardiness. Some also cross these with Golden Bee shrimp, but this results in off-white and cream coloring instead of the bold white. These shrimps appear to be simple Crystal Red or Crystal Black shrimp but breeding them together can result in whatever Taiwan Bee they were bred to. When buying Mischlings, do your research on the buyer, as there have been issues with people selling normal Crystal Reds and Blacks as Mischlings for a higher price. Shrimp are much more sensitive than fish and require special test kits on top of the normal ammonia, nitrite, nitrate, and pH tests. If there is any amount of ammonia or nitrite, you can kiss your shrimp goodbye, as they are incredibly susceptible to it. Nitrates cannot exceed 20 and should be kept at 10 or below. Shrimp also need tests for kH, gH, and TDS. Carbonate hardness, or kH, is often referred to as the buffering capacity of the water and is closely linked to pH. A high kH means that you will be unable to change your pH, while a low kH means you can easily change the pH. General hardness, or gH, measures some of the minerals in the water, namely the magnesium and calcium that shrimp need to molt and build new shells. TDS is the Total Dissolved Solids and measures everything in the water but doesn’t tell you what it is. With a low gH and TDS, shrimp will not be able to build new shells and will die. If the gH and TDS are too high, the shrimp will form a shell that is too hard to molt off and it will die. 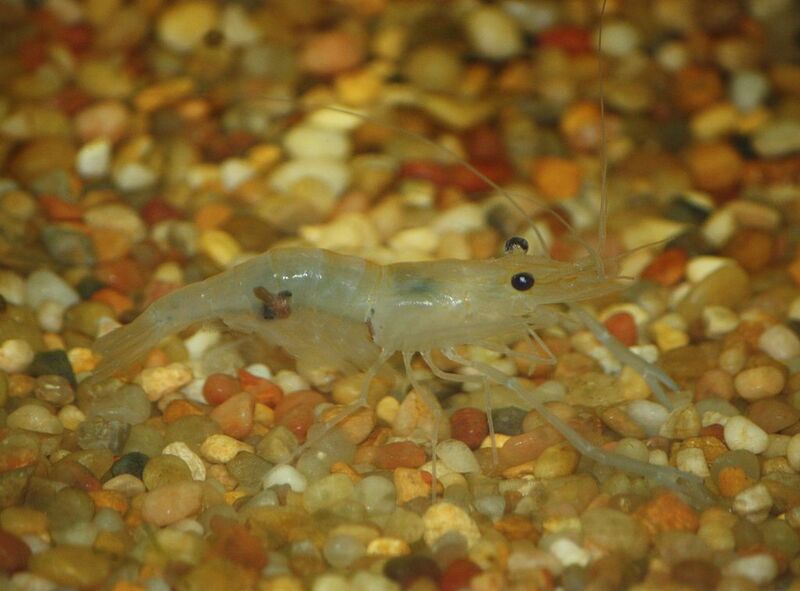 Shrimp that die due to molting problems often have a white or clear band behind their head. Bacterial infections in shrimp is often caused by poor water quality, and depending on the severity, it may be very difficult to treat. Dead shrimp that are infected often die with red or orange heads. Living shrimp may show the same symptom, along with a milky white or opaque interior. Treatment includes anything from Kanaplex, Tetracycline, and Oxytetracycline can be used. These are all antibacterial medications that can treat gram negative bacterial infections. A 100% water change and reacclimating the shrimp to new water parameters can help if the poor conditions were caused by substrate turning or other excess waste and buildup. It can also help oxygenate the water, which is essential for curing shrimp. If you use an antibacterial, be sure to increase aeration, as they can remove some of the oxygen from the water. Red spot or Rust disease is one of the most devastating shrimp diseases and can easily destroy hundreds of shrimps in a matter of weeks or months. It is characterized by red or black, or red and black, spots appearing on the shell of the shrimp. The spots range in size, shape, and coloration, and may appear to be normal coloration at first. This usually occurs due to poor water quality or not quarantining new shrimp. Treatment ranges from hydrogen peroxide and oregano oil to Levamisole HCL, which is also used to treat callamanus worms, to salt dips. Shrimp are surprisingly resilient when it comes to salt dips, so dips are not a bad place to start. These parasites are extremely small and may appear to be small fuzzy fungus at first glance. They are very difficult to see clearly without a magnifying glass or similar, but they look like small, elongated triangles stuck to the sides, belly, and rostrum of the shrimp. Dosing PraziPro at ¾ dose almost always gets rid of them, and a salt dip definitely will. The good news about these is that they are incredibly easy to cure and have a low death rate. However, you will have to remove any molted shells from the shrimp in order to prevent reinfection, as they can remain on the shells. This is a relatively new issue with shrimp and is unfortunately rapidly expanding. Once you see what looks like a green fungus on the underbelly of your shrimp, your whole colony is likely infected. This is a parasite that so far seems to only affect neocaridina. Separate any shrimp showing the green “fungus” to one tank, take all “healthy” shrimp to another tank, and dry out the old tank. You must start the tank and cycle over again. Some have had success using salt dips to get rid of the parasite, while others have been able to get rid of it using food dosed with Kordon Rid Ich. Kordon Rid Ich contains Malachite Green and Formalin, and the combination of these two has the greatest success rate for treatment. Hydra is not a disease, per se, but rather something that commonly occurs in aquariums. It is only an issue if you keep fry or small shrimp. Hydra has a small, thick body and seven thin tentacles. The body is normally only a few millimeters long, but the tentacles are two to three times as long. Hydra attach the base of their body to an area of the tank with high flow to catch passing particulates and infusoria. They especially love copepods, and if your copepods suddenly start disappearing, it could be an early warning sign that you have hydra. Hydra are capable of moving themselves and inching along glass and substrate. They sting adult shrimp, which can kill them, and kill and eat shrimplets. The best way to get rid of them is to dose the tank with fenbendazole, which is safe for shrimp, but not for any snails.